When to visit Kauai? It's a good question, and it's an easy answer - anytime! Seriously, Kauai has a remarkably stable weather pattern year round. During the winter you'll experience highs in the mid-70's (23-24°C), while summer temperatures usually get into the mid-80's (28-30°C). Kauai is wetter than the other islands and is actually home to the second (arguably THE) wettest spot on the planet at Waialeale. But this lush, verdant atmosphere is what makes Kauai the "Garden Isle." Kauai's wettest months occur during the winter, which lasts roughly from late November through March. This is also the time of year when humpback whales migrate to Hawaii and can be seen in waters all around the island. If you are on Kauai during these winter months, be sure to book a Whale Watch Cruise. If you want to learn more about the amazing humpback whales, make sure to check out our Whale Watching page. The winter months are the best time take a whale watching tour. Kauai's North and East Coasts are together referred to as the windward side; which is typically wetter than the rest of the island. 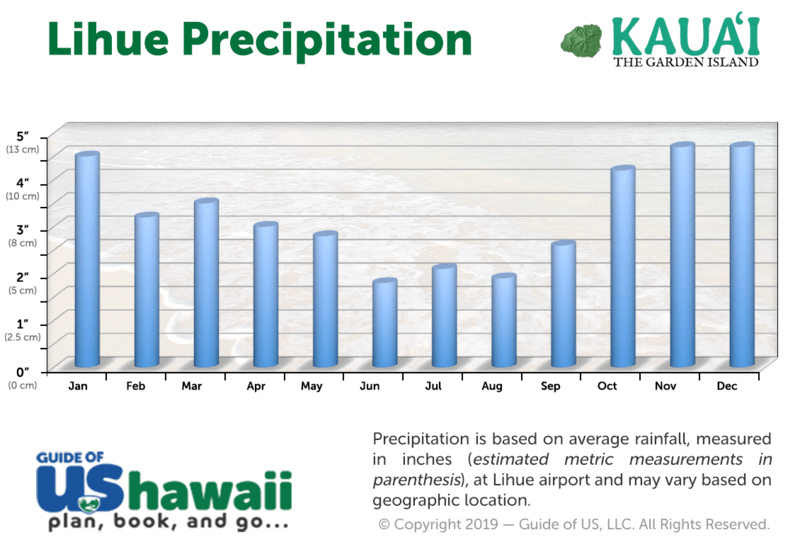 The driest locations are in south Kauai near Poipu or further west towards Waimea and Kekaha. Ultimately, most rain showers are brief and the sun quickly returns; only occasionally does a weather system bring prolonged rain to the island. To stay abreast of weather conditions, you can always check with NOAA online. Please note that we advise against listening to The Weather Channel since they'll forecast rain every day (which is technically accurate, but it's unlike rain on the mainland - it comes in bunches as we discussed above). 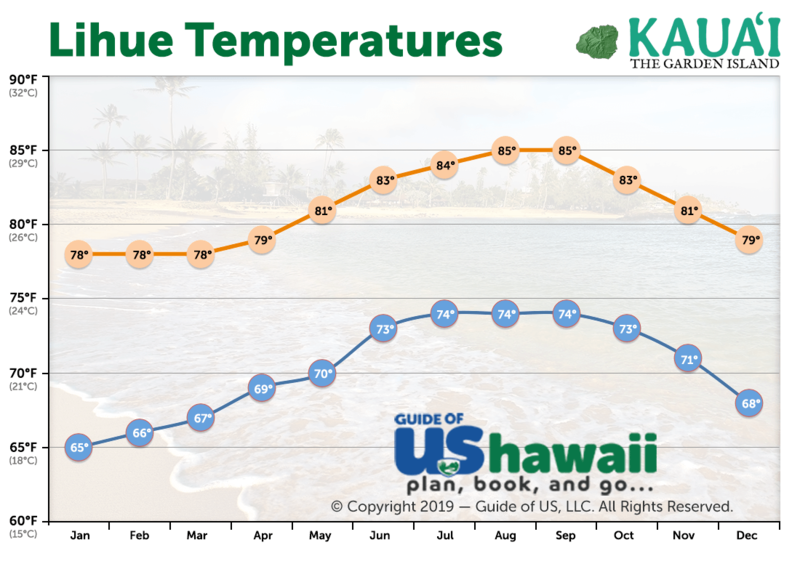 For more information about Kauai's weather and the best regions to stay, be sure to check out our Kauai Weather article. The best deals, accommodations wise, are found during the months of April - May and September - early December. The holidays, especially Christmas, are the busiest time of year and prices will reflect the increased demand. During the spring and fall, visitation is typically down (meaning fewer crowds) and prices will reflect the decreased demand for accommodations. When you put it all together and consider the weather, crowds, demand, and prices, we think the ideal months to visit are April, May, August, September, and early October. If you're wondering where the best places to stay are located, be sure to check out our Where to Stay on Kauai article.